How do we trust each other without proof? We discussed the concept of “culture technology” a few weeks ago, and this is exactly it. If we want to level up our civilization and be capable of exchanging value without a pure reliance on money, there has to be some other non-monetary infrastructure that creates the vessels and channels for exchange. you were a bit ahead of your time with this post, eh? we are just now beginning to gel and form into some type of connected node with a shared values base, but i have found that the requirements are much steeper than imagined. you mention time, initiative and trust as key elements…. and we’ve found that it’s much easier to talk about trusting than to trust. at least i’ve found. and it’s easier to talk about getting something off the ground than to actually do it. i’ve learned so much about myself and others these past few months as i’ve actively been cultivating relationships and engaging in small experiments working with others on a short-term basis. a book i’m reading now that i highly recommend to anyone who is interested in building an emergent city is Tribal Leadership. it’s all about how to evolve culture – starting with your own personal evolution and then radiating outward into your tribe. one of the big insights for me right now is that in a high-functioning learning team/tribe/node/emergent city, trust is the DEFAULT. meaning, it’s not about earning trust before you begin. you trust. you assume good will, unite around a shared vision, and start the expedition to new lands. this has been extremely difficult for me to do. i WANT to. but i don’t just trust people, and even for the ones i do, something in the back of my head is staying alert and waiting for that shoe to drop, fearful of being let down, disappointed, or abandoned. i wonder how many of us are on this cusp…. so ready to evolve into the next stage so we can really begin together, but are holding ourselves back, trapped in old patterns, limiting beliefs, unhelpful narratives. i know we’re getting there, and that is exciting. it’s also healthy for us to be aware that if we want to build a new culture, a new society, a new kind of life for ourselves — it is very much an inside job first. So trust is a leap of faith. I don’t think I know how to actually do it. saves so much energy. no? creating spaces of permission.. where there is nothing to prove. believing.. there is never nothing going on. Moving from knowing you need to trust to doing it is a shift in perspective. If you view trust as a prediction you will find that you can never trust. Another may always do something you didn’t expect, or something that doesn’t fit what you’d have done in like circumstance, or what you’d have hoped they’d have done. So a predictive trust is doomed to failure. Even the most upright and faithful person has let someone down. If you view trust as an assessment of resonant balance, and bring a commitment to continue to trust no matter what happens, that trust will always endure. For you then place the responsibility for the failure in the bond of trust with you rather than with the others. When you make trust conditional, the conditions for failure are possible. When you make trust unconditional, you open up the possibility for others to always remain trustworthy. So the threshold for trusting someone changes from: can I predict this persons behavior, to do I understand this persons heart and is that heart resonant with mine. I have found that I can only truly understand the heart of those who live their lives consistent with their stated dreams and aspirations and most of all: spiritual / ethical principles. So I confine my trust to those who live their own lives for their own reasons and actively and constantly root out their own hypocrisy. When their heart—as shown by the spiritual and ethical principles their lives demonstrate—resonates with mine, I know that I can never be let down. For if there is a failure in expectation, it is just as likely to be my failure as theirs, and I will learn from each failure. These are the people I trust. Very inspiring comment. Thank you. Treat a man as he appears to be, and you make him worse. But treat a man as if he were what he potentially could be, and you make him what he should be. When I think of trust, it’s rather like the way writer Laurie Lee saw the essence of charm. It is by continuing to offer trust, in spite of having trust betrayed, that we become trustworthy and disarm without force. I am working on trust as well in a different context. It takes practice. I had to drop thinking about how to trust. Trusting is from the heart. For me personally, it also comes to trust on a deeper lever, after I dropped most of what I connected to “spiritual”. It’s about trusting in life generally. Trust is the most fragile of human feelings. Long and arduous in the making, so easy to destroy in one moment. A new order begins with counteracting the emerging social order: Feudalism. We’ve undone the Renaissance, the Reformation and Bourgeois Capitalism. And all since 1980. The Boomers built this economy Post-WWII, first with the size of the generation and then with their productivity, But by 1980 when they wanted it all, it was time to not care about what happened to others–it’s all about ME. And now, as they begin to retire in large numbers, the powers that be want to take it all back. Ironic Retribution? This is certainly worth a blog, if not a book. True Davit, but:before smiting all the kulak boomers…. To amplify an element of Jeff’s comment, the ying and yang of trust ultimately maps to the degree one trusts oneself, or does not, that ultimately equates to the degree to which one trusts or distrusts others. Perhaps a personal decision and commitment to living in integrity and alignment will organically attract those that do the same. So the question becomes less about learning how to trust; but rather, in the face of cuing up untrustworthy people or situations in your life that affirm your fears about trust, you ultimately are vested in affirming that folks just are not trustworthy. The decision to and request of the universe to re-cast who you play with in a trust infused frame is ultimately up to you. We actually do get exactly what we ask for, whether consciously or not. Trusting oneself? The capacity for self delusion is infinite. That was my thought in making the statement. There is also an emotional dimension that says if the sponsoring thought or inspiration comes from love, rather than fear, generally the results will reflect a positive outcome. If the starting premise is derived from fear (in this case of the others betrayal or failure to meet commitments), then generally we are likely get exactly what we asked for, and they will in fact betray our trust in the outcome. I disagree that trust is a giant leap of faith. It can be achieved incrementally. Emerging culture tech like the EBay rating system allows for reduction in the amount of faith required before a transaction is made. Trust can be developed by working with people on bite-sized projects systematically, rather than making deep plunges! Trust is a leap of faith in your self. Until it isn’t. 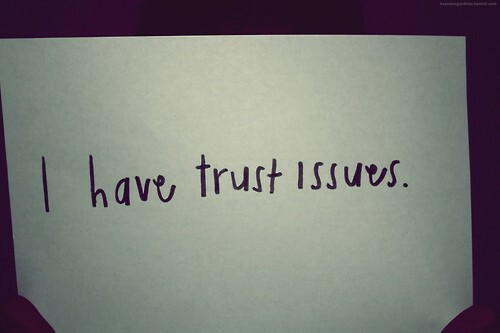 I’ve never had issues trusting. I have been abandoned, deceived, and betrayed, but it never has made it more difficult to trust. For me, trusting is as easy as breathing. I trust flakes to not follow through on what they say. I trust liars to try and deceive. I trust people to be who they are. Most people would say that a liar is untrustworthy, but they haven’t broadened their view of what it means to trust. I think the word trust is too often associated with expectations. If I expect someone to be who they are not, then I will be disappointed and thus lose trust. But what really happened is I trusted my assumption or expectation. When they fail to meet those, then I mistrust my self and that hurts. Then I push the blame on them for not meeting my expectation. When I drop my expectations, then trust can be freely given without issues. I hope that makes some sense. Thanks for writing! A strict policy of keeping commitments is useful for generating trust. A useful exercise in this domain is to re-frame commitment by viewing all commitments not as promises to others but rather as promises to yourself. Trust is within ourselves. I believe it is something you either have or you don’t. Indeed, you can nurture the feeling and you can teach yourself to trust someone else than yourself, but it can be hard on a personal level. When it comes to trust in business, I think that is a different story. You tend to trust the person’s expertise and abilities, rather than the person. When opening a startup, for example, you need to trust the other founders. But you don’t need to trust them as people, but their capabilities of making the business grow. This is what I believe, feel free to disagree. I’d been trying to think of an example of how trust began with a leap of faith and began to propagate. A recent investment in trust then reminded me of how a group of people came together and without knowing each developed into a small but coordinated effort. ” trust is a leap of faith”, yes, and you know how to do it. Everyday in traffic you trust drivers to do the right thing to keep your life intact, and most do. Trust is what we do when we lack data. We may justify and reinforce our trust or leave it and abandon the new challenge. Thank you, Venessa and commenters. This metacognition sparked a blogpost. Summarizing what virtual acquaintances taught me about digitized trust-building. Trust is a distancing phenomenon, a measurement of correlation between what is and what will (or might should or could) be. It reinforces the separations between people, space, time. But, if the world is moving along as it will and as it must, then we (self and others) are simply being as we must be. Trust is about forgiveness. No one truly lives up to our expectations because dreams never match reality. We can’t even dream about what will happen, because we can’t know all the possible directions the stream might take. When we forgive — and recognize that all are being as they must — then that resonance gives rise to trust. Even when people behave “badly” or in an untrustworthy, or even evil, manner, they are simply being. You can always trust that people will be. And take it as it comes. One may need to oppose the behavior, not not the actor. And, when done within a context of forgiveness and trust, that action is more pure. The first question essentially gives no option but to take a leap of hope – to engage in wishful thinking and see if things come out ok. The second question gets us to reflect on our experiences – it dares us to pay close attention to “gut feelings” (and whether ours tend to be right or wrong). It challenges us to be scientific about our decisions – to carefully record our histories of trust, success, and failure, and look back at them often. We can never be certain about something fundamentally unknowable (whether or not a leap will land us in a good spot). We can be certain about our own abilities. Just like a teacher cannot be certain of whether or not a student will learn but can know what style works best for him/her, we become the most comfortable in our positions and most effective by looking at our own behavior.